Safe, effective and environmentally friendly! Professional saw shops know that clean cutting edges run cooler, cut better and last longer. 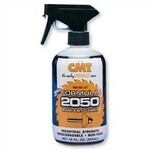 That’s why we had several quality blade sharpening services test the CMT formula 2050. The results? In a word, phenomenal! SAW BR-BRITE is a very economical powder used for removing pitch and gum. Bottle contains 3-oz. of super concentrated powder when mixed with plain tap water makes 1 to 1-1/2 gallons of solution. Soak for 10-15 minutes. Longer if necessary. Brush lightly with brass brush, rinse with clean water and dry thoroughly. Safe, effective and environmentally friendly! Professional saw shops know that clean cutting edges run cooler, cut better and last longer. That’s why we had several quality blade sharpening services test our formula 2050. The results? In a word, phenomenal! Most blade and bit cleaning products work with a dissolving action, using some powerful and nasty chemicals to dissolve wood residues and adhesives. Our safe and nontoxic formula 2050 penetrates the microscopic cracks in the resin and attacks the bond between it and the carbide or steel surfaces. The resin releases its grip and you simply wipe it off. Formula 2050 keeps your tooling clean and helps you increase the time between sharpening and replacement, and your satisfaction is guaranteed! This product received a five-star performance rating from wood magazine.